The annual Million Paws Walk is the RSPCA's biggest fundraising event of the year. Together with other supporting companies the event creates awareness of their dedication to protecting animal welfare. Its also a great opportunity to encourage responsible pet ownership within the community and raise much needed funds. 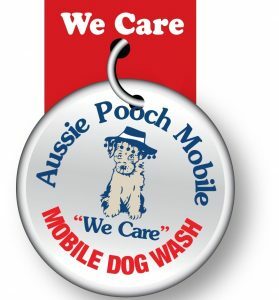 Aussie Pooch Mobile Dog Wash has supported the RSPCA for 20+ years and participate in the Million Paws Walk annually. With the dedication of our team and the support of the public we have raised over $200,000 to date. Million Paws Walk is a great day out for the whole family. Any size, age or breed is welcome to attend, as long as they are fully vaccinated and friendly. In fact, you don’t even have to have a pooch to join the fun! Money raised through fundraising, merchandise sales and activities on the day will help to provide essential care, veterinary treatment, food and shelter for the dogs under the care of RSPCA. To view photos taken at the events, check out our Facebook page. 2017 Million Paws Walk, Aussie Pooch Mobile bathed 575 dogs with 56 trailers and raised $15,276. Together our vast network of Aussie Pooch Mobile operators can help spread the word about other animal welfare issues and are proactive in raising awareness and funds for different programs that improve the lives of mans best friend. Another community fundraising activity that Aussie Pooch Mobile conducts are Bathathons. A team of our operators get together and raise much needed funds for animal welfare clubs. The members of the clubs and general public are encouraged to bring their pooch along to be bathed and the proceeds are donated to the event holders. If your organisation would like help from Aussie Pooch in fund raising please feel free to drop us an email.